This is how Bar Agricole does steak and eggs for brunch. Photo: © tablehopper.com. 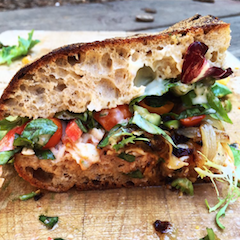 A peek at some of the sandwich bodaciousness Josey Baker is concocting at The Mill. Instagram photo via @joseybakerbread. Some restaurant news around town for you. First up, I was surprised to run into ~FRANCES~ chef Michaela Rahorst out for dinner during the holidays (instead of seeing her hustling in the galley kitchen at Frances), and it ends up she has left her position. I checked in with Melissa Perello’s PR team, who expressed they were all very sad to see Michaela go (she has been at Frances since it opened). Connie Tsui—who has been with Frances since 2015—has been working with Michaela as her right hand since Michaela took over the chef position in September of 2015. Connie is currently transitioning into the role of chef de cuisine and working very closely with Melissa at this time—they expect that she will take over the position officially by the beginning of spring. In the meantime, I’ll keep you posted on Michaela’s whereabouts. For now, she’s doing things like running marathons and having fun cooking with her boyfriend over at Poesia restaurant. 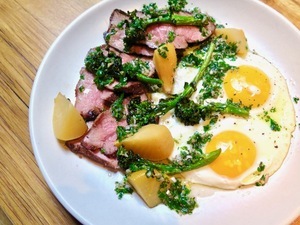 Good news: the fine folks at ~BAR AGRICOLE~ have decided to extend brunch to Saturday as well, so now you can come by for fab dishes like grass-fed tri-tip with fried eggs, rutabaga, Piracicaba broccoli (which is like a sweet broccolini), and salsa verde both days, 10am-2pm. Sunday dinner service has also been added, 6pm-9pm. The newly opened ~FLORES~ in Cow Hollow is launching brunch this Saturday January 14th and will serve Mexican brunch Saturdays and Sundays 11am-3pm. Dishes include pancake de elote ($13, corn pancake, maple crema, powdered sugar), huevos poblanos ($13, chicken mole, mini quesadilla, pickled onion, oregano), and carne asada ($19, 6-oz. skirt steak, rice, refried beans, two eggs any style, housemade tortillas, pico de gallo). The Vida Fuerza ($6, cold-brewed coffee, coconut milk, cinnamon) will get you back in the game. There are also large-format beverage options, like a passion fruit mimosa for six (which is basically a bottle of bubbles and a carafe of passion fruit purée—so it could be good for just two people, or even one, heh). 2030 Union St. at Buchanan, 415-796-2926. After doing a fair amount of testing, Josey Baker is rolling out sandwiches at ~THE MILL~, served Thu-Sun 11am until they run out. This week’s beast is roast cauliflower, spring red onion, Tokyo and scarlet turnips, baby kale, JBB special sauce, roast garlic aioli, and provolone, $10. Expect something different each week! They are also serving beer and wine for their pizza nights, Mon and Wed from 6pm-9pm. Look for beers from San Diego’s Pizza Port and some French wines.